Do you live in an area that gets really cold in the winter? If you do, then you may have seen large trucks driving down the icy roads sprinkling salt over the ice. Have you ever wondered why they did that? It’s simple; salt + ice = a chemical reaction! The salt makes the ice melt and break down, making the roads safer for drivers. 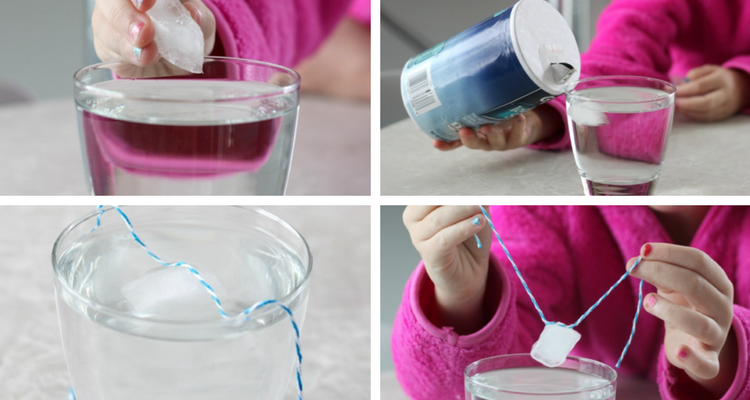 Try this experiment with a few basic kitchen supplies to see how the salt reacts with the ice cube to pick up a piece of string. 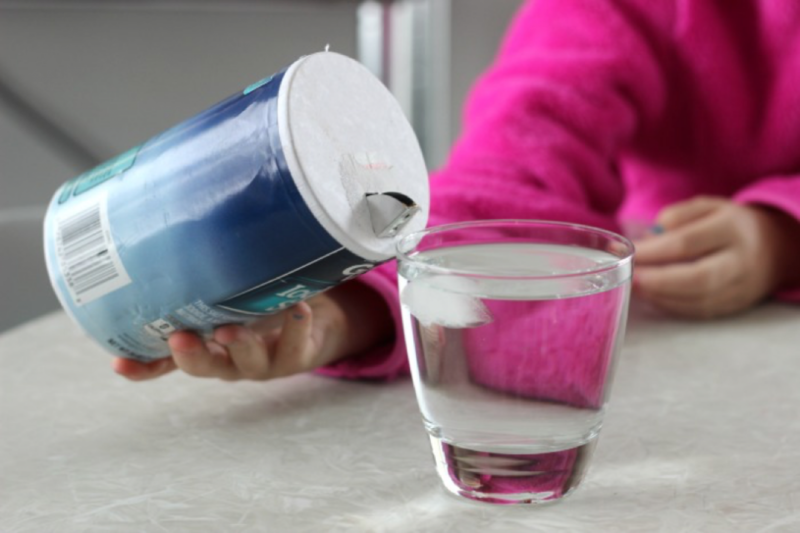 Fill a glass with water all the way to the top. Drop 1 ice cube into the water. Sprinkle with ½ tsp. salt. Cut a piece of string longer than the width of the cup. Lay the string over the ice cube. Lift both ends of the string and see what happens! Cool, right? Now go and show your friends how you did this little trick—I mean, science experiment! 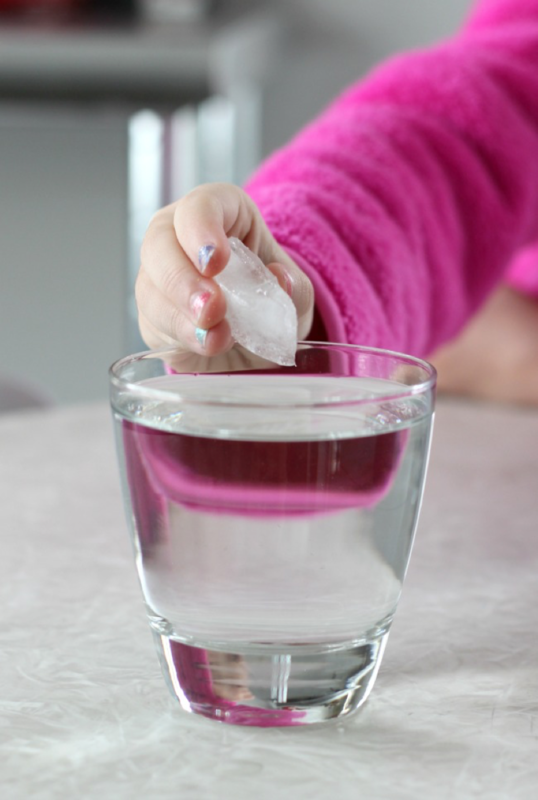 Salt lowers the freezing point of water to below 0 degrees Celsius. 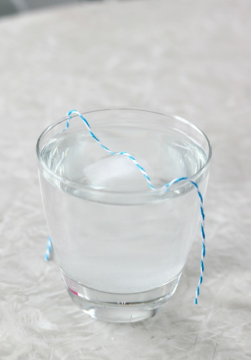 When you add salt to the ice cube, it melts a thin layer on the ice cube. 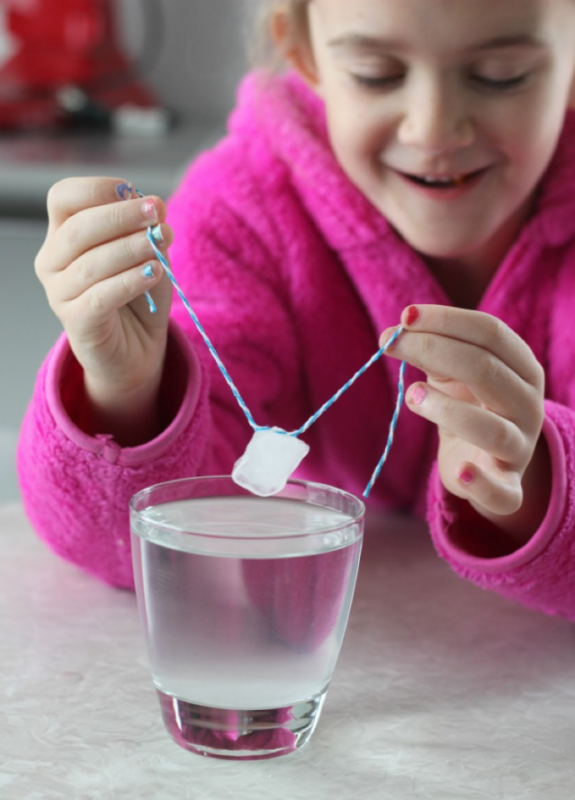 The water then re-freezes around the string, allowing you to pick it up! We sprinkle salt on the roads to keep ice from forming. It’s science at work, keeping us safe! Learn more about the everyday science in our lives by subscribing to Science Expeditions. In each monthly package, kids receive hands-on projects like building a stomp rocket or constructing a spectroscope. Each package follows the adventures of comic book characters who meet international scientists and learn about their work. Engineer an elevator in Hong Kong, or build a boat in the Caribbean Sea – kids and parents alike look forward to each month’s new adventure. Inspire Your Child With a Science Expeditions Subscription! Every month, your child will receive a package full of science experiments and STEM-related activities with themes like rockets, forensics, caves and crystals, slime and so much more! these emails are great! I love all the ideas that you put together. so inspiring for kids! just wondering if the boys that I’ve sent Little Passports to are getting these emails as well? I’d love for them to see these things as well! Hi Sharon – we’re so happy that you enjoy our blog! If you entered a parent’s email address when you purchased, they’re also receiving our emails. If you’re not sure, you can send us a note at support@littlepassports.com and we can check for you!